Now we have looked at Ren Ma i任脈 ,Du Mai 督脈 and Dai Mai帶脈 we will now look at the most important channel, the Chong Mai 衝脈. If the Chong Mai is clear and smooth than all the other channels, Twelve Main Channels 十二經絡 and the Eight Extra Channels 奇 經 八 脈 will also be smooth and this is why in our Qigong practice the Chong Mai is the most important channel. For ordinary people the Chong Mai is made up of 3 lines, all of which start at the Bao Zhong 胞中. The first line starts at the Bao Zhong, goes to the Huiyin 會陰 and then follows the spine. 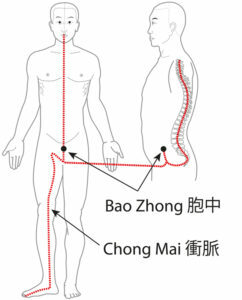 The second line goes from the Bao Zhong, down to the Huiyin, comes up front of the abdomen, to the chest, throat and mouth. 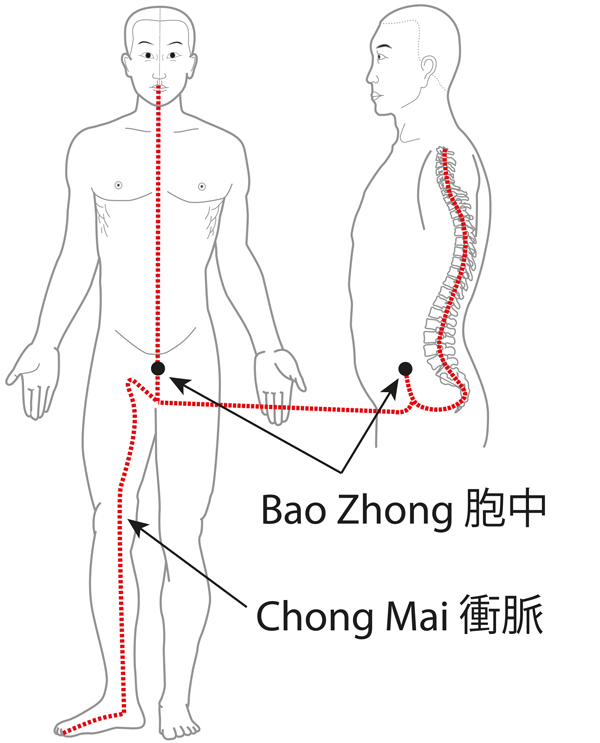 The third line also starts from the Bao Zhong but passes down the inside of the legs, where the three Yin Channels (Kidney, Liver and Spleen Channels) run and then finally down to the big toe. This is the path of the normal Chong Mai. When we have practised Qigong for long enough our Qi becomes strong enough so that all these three lines merge into one which starts at the Lower Dantian (the Bao Zhong is part of the Lower Dantian) and then go straight up to the Baihui 百會. At the same time it goes straight down to the Yongquan 涌泉 point not only the big toe. Once the Chong Mai is smooth, then all the Eight Extra Channels will be smooth. The Qi will flow all over the body and all blockages will be cleared. This is why the Chong Mai is the most important channel. Practising Horse Stance 馬步樁 or Hard Qigong’s Ding Qi 頂氣 will help to keep the Chong Mai flowing smoothly. Of course Wild Goose Qigong 大雁氣功, Chun Yuen Quan 俊元拳, Chen Taijiquan 陳家太極拳 and even long Sui Lim Tao 小念頭 will also help. When it is clear and smooth we can feel the Qi coming out of the Baihui and Yongquan points.